The subscription period for this journal is from January 1 until December 31 of the current year. Journal issues that have been published in this year will be included in the first shipment after you have placed your order. Die deutschen Aims&Scope finden Sie im Anschluss an die englischen Aims&Scope. 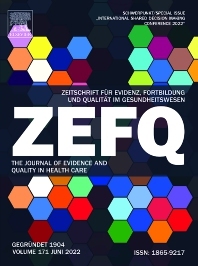 ZEFQ is a peer-reviewed, multidisciplinary and cross-professional journal that publishes original papers, reviews, short reports, and selected conference papers on all aspects of evidence and quality in health care. Publication languages are German and English. ZEFQ addresses health practitioners, health care managers, researchers, policy-makers and methodologists who have an interest in evidence-based health care, health care quality improvement, patient safety and decision-making in health care. It is also of interest to anyone involved in the provision of health care programs and other contributors to the health care system. • To provide a forum for the health community to discuss the below topics. • To put emphasis on both health benefits and economic benefits. • To advance the transfer of science into clinical practice. This is not an exhaustive list, and the Editors will consider articles on any issue relating to evidence, quality and decision-making in health care. Publikationssprachen der ZEFQ sind Deutsch und Englisch. Eingereichte Originalarbeiten und Fortbildungsbeiträge werden im Peer Review Verfahren von unabhängigen Gutachterinnen und Gutachtern beurteilt. Der Publikationsprozess folgt den Recommendations for the Conduct, Reporting, Editing, and Publication of Scholarly Work in Medical Journals. Das Editorial Board und die Gutachterinnen und Gutachter arbeiten ehrenamtlich und repräsentieren breitgefächerte Expertise zu den ZEFQ-Schwerpunkten. Die ZEFQ veröffentlicht Originalarbeiten, Fortbildungs- und Diskussionsbeiträge sowie aktuelle Informationen zu Forschungsergebnissen, Methoden, Projekten und Erfahrungen aus den nachfolgend beschriebenen Bereichen, ihren Schnittstellen sowie verwandten Gebieten. Ziel der ZEFQ ist es, ein Diskussionsforum für die genannten Themengebiete mit Schwerpunkt sowohl auf den gesundheitlichen als auch auf den wirtschaftlichen Aspekten zu bieten und den Transfer von Wissenschaft in die klinische Praxis zu befördern.